Rewards Canada: A look at how The Marriott Bonvoy American Express Card provides huge value! 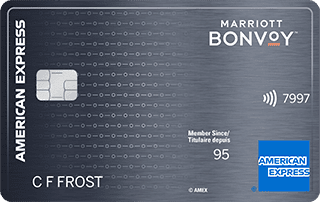 Late in February American Express released the refreshed Marriott Bonvoy™ American Express® Card. This is the new version of the Starwood Preferred Guest Credit Card from American Express that was always highly recommended by us for many years. With the name change also came an increased welcome bonus of 60,000 Marriott Bonvoy points when you spend $1,500 on the card within the first three months of having it. For many of you who may be new to points and miles or just the Marriott program, you may not be fully aware of what 60,000 points can really bring you. In this post we'll give a few examples of this value and why this card ranks in our Top 5 Sign Up offers for the month despite having an annual fee. On top of the welcome bonus the card has lots of other benefits that extend the value of this card, namely the anniversary free night benefit for hotels which we also look at below! Let's get down to business. I hear your yelling at your screen. Show me the value! What can I get for 60,000 points? So with the 60,000 Marriott Bonvoy points welcome bonus from the card you would can get a room worth $612! Oh and if you are thinking maybe the value could be less because you could book via a third party? Well Expedia, Booking.com and the host others all were selling the above room for $629. Subtract the annual fee of $120 and the card already has you $492 ahead. There are very few cards in Canada that will give you $492 in value just from the welcome bonus. Four nights here would cost you 50,000 points for a $700 stay. Minus the $120 annual fee and you've made your welcome bonus worth $580 and you still have 10,000 points left over to use elsewhere. This would push the value of the welcome bonus closer to $700! Redeeming 25,000 points for $396 stay shows us the best value yet in our random searches until you keep reading on! Imagine two nights, 50,000 points for $792. Now you have $672 in value from the welcome bonus and still have 10,000 points leftover. Are you starting to get the picture of the immense value of this card? Enough with the Canadian hotels you say! Show me something far away! $2,109 USD for the welcome bonus of 60,000 points? Unheard of value! But let's be real - you're not going to stay here for one night. You could achieve two nights if you have a partner/spouse who would also get the card - both of you would get 60,000 points for 120,000 in total and you have two nights. The two cards would cost you and your partner C$240 in annual fees but as you can see the value being pulled from two cards could be huge! Stay for 5, pay for 4 Benefit! 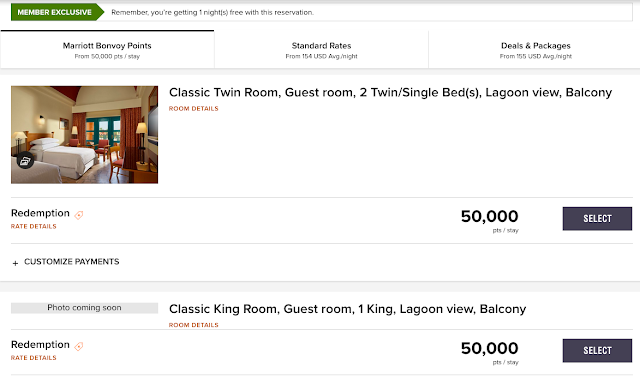 You could get 5 nights at the Sheraton Miramar Resort El Gouna in Egypt and still have 10,000 points leftover as it is a Category 2 hotel that runs 12,500 points per night. However with the 5th night free you are only paying 50,000 points in total for a stay that would otherwise cost you US$912 or about C$1220. Again the card is providing you a savings of about $1,100 after taking the annual fee into account (and you still have 10K points leftover!) Technically speaking, since you have to spend $1,500 on your card to get your Welcome Bonus you would have more than enough points to actually get 6 nights at this hotel for 62,500 points. I could go on and on with many more examples but I think by now you should be able to see what the welcome bonus on this card can provide you. How about keeping the card beyond the first year since you won't have the welcome bonus? You definitely would want to, even if it is just for the anniversary free night of at a hotel up to 35,000 points. Back to examples for this one! While I was searching up Mauritius I saw that the Westin Turtle Bay Resort and Spa is only 35,000 points per night. The 35,000 points you got as an anniversary benefit just got you a $287 room for $120. This is just one example of the most realistic type of redemption you would be making with this benefit. It shows that this is a card you will want to keep in your wallet as it will continue to give you more than what you put into it. There you have it - a look at the value this card provides strictly from the welcome bonus and anniversary free night benefit. We didn't even touch upon the 15 Elite Night Credits given to you every year you have the card, the automatic Silver Elite status (and Gold if you hit $30,000 in spending on the card), the ability to convert to a wide selection of airlines and the earn rates of 5 points per dollar spent at Marriott Bonvoy properties and 2 points per dollar everywhere else. Now, do you see why the card ranks as one of top five overall cards in Canada (Rewards Canada's Top Travel Rewards Credit Cards for 2019) and as one of the Top 5 Sign Up offers? Do you have the card? Let us know how you have maximized the value from it in the comments section below! - American Express is not responsible for maintaining or monitoring the accuracy of information on this website. For full details and current product information click the Apply now link. - This post was sponsored by Amex Bank of Canada. The views and opinions expressed in this blog, however, are purely my own.